This would have been blasphemy to me at one time, I didn’t see the difference between faithful and faith-filled. My logic and the logic I’d hear from others regarding decisions or beliefs (being “faithful” to God) went like this, “That’s why God gave us brains. Think it through–be logical–He’ll help us if things don’t work out,” or “What are the pros and cons?” Mind you, it’s not that anyone wanted to be unfaithful or unfaith-filled, quite the contrary. Nobody, me especially, wanted to make Jesus look bad or be perceived as wishy-washy regarding doctrine, or allow us to go through struggles, or, or, or. In reality, all decisions were based on logic and not faith–especially when it came to beliefs–God forbid if my beliefs were challenged. I had the truth!!! But God says that mans wisdom is foolishness to Him. Hummm, that pretty much blows all that logic and brain stuff out the window than doesn’t it!? So we’re left with this–live illogically–ride the correct steed! ← Which Would You Rather Be On?–A Steeples or Solid Ground? I really liked this post, Kara! I was one of those who’s faith was constrained by rationalism and my limited human understanding of the sciptures. How ludicrous to think that the human brain can grasp the things of Almighty God, outside of the gift of continual revelation by His Holy Spirit in every moment of our abiding! 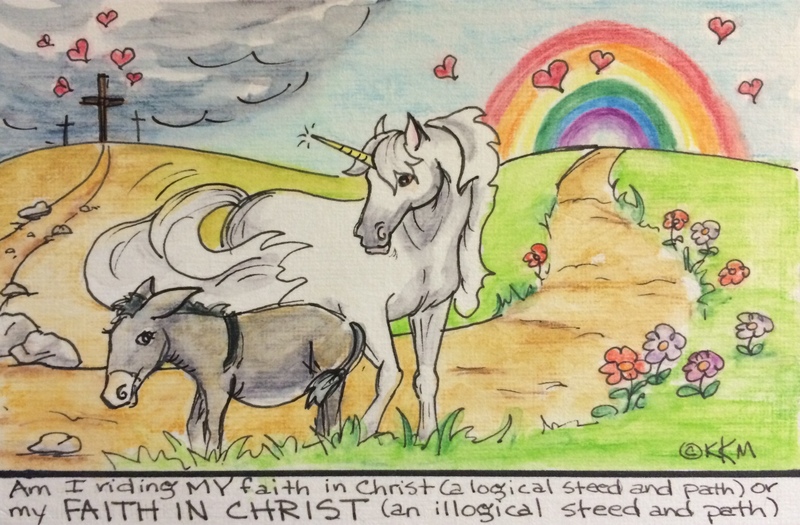 Looking back, such rational “faithfulness” looks plodding and pedantic compared to the upward flight astride the “faith-filled steed” of allowing God to be the God of that which is above all that which we think to ask or expect! Awesome is He!